Walking on a beach with friends in Otaki, New Zealand I mentioned I was interested in basket weaving. “Oh the man who made the baskets in Lord of the Rings is just up the street” said one of them. So off we went! Don’t hurry your work; a well-made basket can last 40 years. Use the cleaver tool to tighten the weave. To test a willow variety for suitability. Hold it by the narrow tip and twist in a circle. Good tools make good work. How to grow willow in a small place. Mr Douglas in his workshop. Cleaver to be sure the weave is tight. A bodkin for making holes to feed strands through. Soaking trough for dried willow. Last year I planted a new rhubarb plant and excitingly awaited for it to grown large enough to make my favorite strawberry rhubarb pie. However, I was upset to hear that rhubarb take at least a year until it is large enough and producing beautiful stalks for consumption. So patiently I tended my rhubarb last spring and summer. This spring I was so excited to see it coming back and starting to send out beautiful green leafs, knowing this is my year for rhubarb! It you are lucky enough to notice a young leaf before it emerges, it is one of the coolest things! Tightly bound up, a tinder green leave almost looks like a brain! Rhubarb is an exciting and rewarding plant to watch grow (especially if you have been anxiously awaiting to harvest it for over a year!!). Today, I noticed my rhubarb had a tall stalk leading to an odd looking bud. Last year, I did not notice my rhubarb had any buds or flowers. Concerned, I first took a picture and then did some research on why in March my rhubarb could be flowering. Rhubarb can flower for multiple reasons including; maturity of the plant, stress (lack of nutrients in the soil), variety of plant, or heat. Due to the age of my plant and the warm winter and spring we are experiencing, I deducted that the heat was causing my rhubarb to flower. Flower heads are common on rhubarb plants during the spring but need to be cut out immediately. 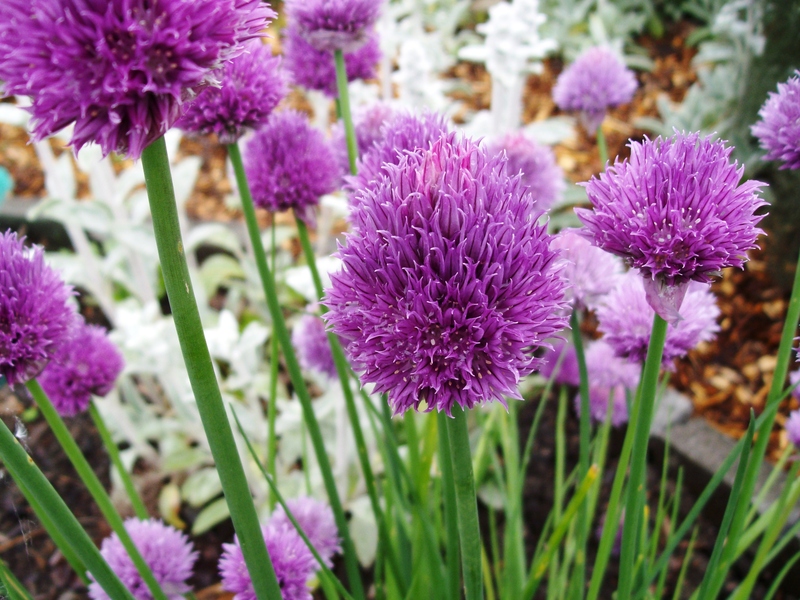 If left, the plant sends it energy to producing the flower instead of growing big juicy stalks. Oranges are in season right now and staying inside on a cold, rainy day to make marmalade is a great way to pass the time. Your whole house will smell wonderful! Peel off the skin by scoring the orange with a knife so you can carefully remove it in sections. Cut the peeled juicy oranges into 4 pieces. Scrape the white pith off the inside of the peel so you are left with the orange part. Put the pith into a cheesecloth or net bag. 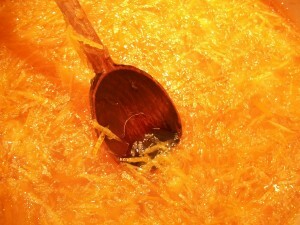 This pith has pectin in it that will help with the gelling process. Take a sharp knife and slice the scraped peel into 1/4 inch wide strips. Put the peeled oranges, bagged pith and sliced peels into a pot and just cover with water. Let sit for 12 hours. Take out the bag of pith and measure how much orange and peel mixture you have. Add one cup of sugar for each cup of liquid. Cook over medium heat, stirring constantly until the mixture thickens. To test if it’s done you can put a small amount of the liquid on a cold plate. If it holds together it’s ready. Put in sterilized jars. Water bath can for 10 minutes. 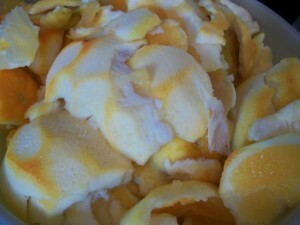 Peeled oranges ready to be cut in quarters. Here’s the pith scraped from inside the orange. Cooking orange, sugar, peel and water mixture. 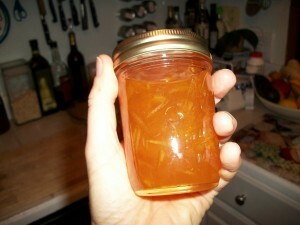 It can take a few days for the marmalade to set. It tastes great on a slice of hearty bread. While winter might not be the busiest period of time for a farmer, it’s a season that can be tough on a farm. The freezing temperatures, snow, sleet, and ice can put a lot of stress on the land and outbuildings, and it can also be tough on livestock. If you are facing a long winter on your farm, you need to do what you can to make sure the land, the animals, and the buildings are ready. The following are a few tips to help farmers prepare for winter. Most farm animals can deal with the cold well; the real problem is when they get wet or windblown in cold weather. If you want to help your animals make it through winter healthy, you need to build them some shelter. A barn obviously works well for providing animals with shelter, but you may also want to consider windbreaks for any areas where the animals may spend time. Consider using an electric chainsaw or multi-tool fitted with oscillating saw blades to build a winter shelter. You should also stock up on straw for bedding. Planting cover crops can be a good way to maintain the soil for the next growing season. 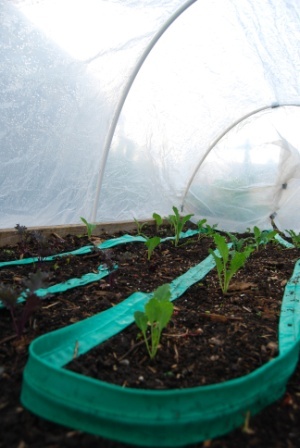 The winter can be hard on soil, and without live plants there, the soil can lose nutrients and moisture. Along with that, the land can also experience problems with soil erosion. By planting some cover crops before winter, you can combat these effects. 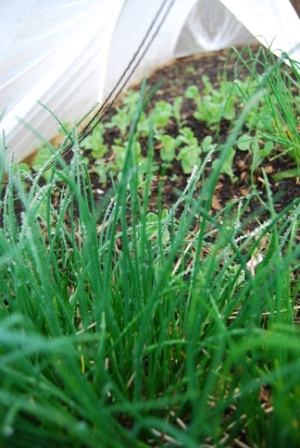 Furthermore, some of the cover crops can provide additional food to your livestock. When the temperature drops to extreme cold, livestock animals need all the help they can get staying warm. Shelter is obviously one way to help them stay warm, but you could also feed them late in the day to help the animals produce more heat once the sun goes down. Livestock animals need a lot of water in winter, and this can be one of the toughest challenges when the temperature drops below freezing. 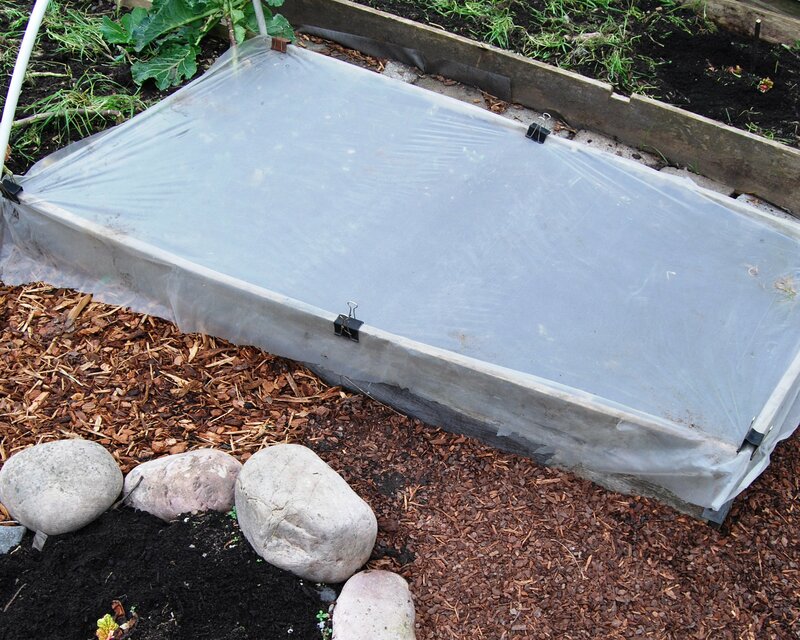 Fortunately, there are several winter watering systems that can help you prevent tanks from freezing. 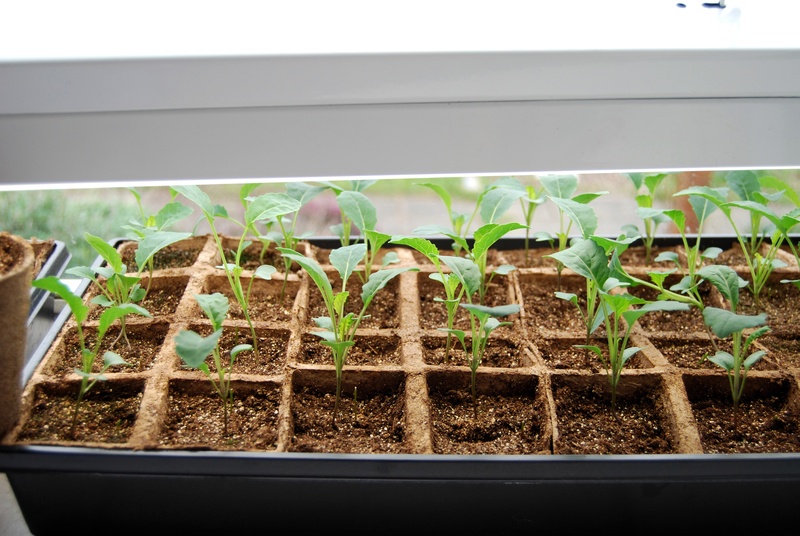 There are devices you can buy and install and there are even some DIY watering solutions. If electricity is an issue, you could also try insulating the tanks to prevent freezing. In the same way that humans need exercise to stay healthy, so do your livestock animals. One issue in winter is that animals tend to spend more time in shelters or huddled near windbreaks. This means they are getting less exercise. If you want to keep your animals healthy, you need to provide them with some exercise. Even if you are just letting them out on an open piece of land, it will do a lot to help maintain their health and overall wellbeing. Beyond being a tough season for your livestock, winter is also a hard season for rodents. When the temperatures drop and natural food sources become scarce, pests are much more likely to come looking for an easy meal. Make sure to protect your feed supply by storing everything in rodent-proof bins. With all of the time spent preparing your animals and land, you can’t forget to take care of your own home. Develop a winter home maintenance checklist to make sure your house is ready for the cold temperatures and rough weather conditions. Common steps for maintaining the home include caulking around windows, checking the weather stripping around doors and windows, and maintaining your heater. Winter can be tough on a farm, but being proactive and taking necessary steps before the weather turns will help ensure your livestock, land, and family come through unscathed.